While the RBSP teams at NASA’s Kennedy Space Center and Cape Canaveral Air Force Station celebrated a job well done following the 4:05 a.m. EDT launch of the Radiation Belt Storm Probes on Thursday, Aug. 30, another group of RBSP engineers and scientists celebrated at the Johns Hopkins Applied Physics Laboratory in Laurel, Md. But for many of those at APL’s Mission Operations Center (MOC) that morning, their job on the RBSP mission was about to get very busy. Immediately after launch, RBSP entered a 60-day commissioning phase of operations, where all of the spacecrafts’ systems and instruments are activated, monitored, and made ready for the two-year primary science mission. After the deployment of both spacecraft from the Centaur stage of the Atlas V rocket some 90 minutes after launch, the RBSP team at the MOC went immediately to work. Their job was to establish contact with the twin probes, and make sure the spacecraft deployed their solar panels and were receiving power from them. 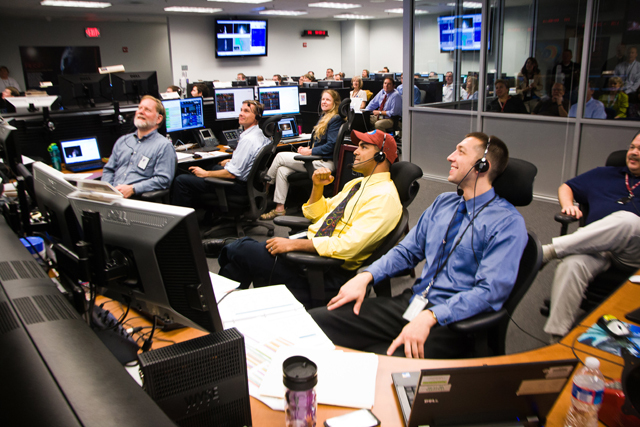 With those power and communications systems checked out, the RBSP spacecraft and teams had little time to celebrate – there was much to do on RBSP’s first day in orbit. The twin Electric and Magnetic Field Instrument Suite and Integrated Science (EMFISIS) booms (two on each spacecraft, located at the edges of two solar panels) were the first instruments to be powered up and deployed. This was done so that the magnetic signatures of the other instruments could be observed as they were powered up. In addition to providing science data for the EMFISIS team, magnetometers on the booms are used by the mission operations team (along with sun sensors) to help determine the attitude of the spacecraft, which in this case is the angle at which they are pointed at the sun. Additionally, the Radiation Belt Storm Probes Ion Composition Experiment (RBSPICE) instrument was turned on – though only with low voltage, just enough to power up the Engineering Radiation Monitor (ERM), which keeps track of the amount of radiation entering RBSP. The first Saturday of the mission (Sept. 1) saw the first full powering-up of one of the many instruments on the spacecraft. At about 3 a.m. EDT, the Relativistic Electron Proton Telescope (REPT) instrument of the Energetic Particle, Composition, and Thermal Plasma Suite (ECT) aboard spacecraft A was turned on, and useable data began to immediately stream back to the REPT team. REPT-B was powered up 12 hours later. Saturday’s achievements didn’t stop there: The Relativistic Proton Spectrometer (RPS) on spacecraft B was turned on, while its sibling on spacecraft A was powered up on Sunday, Sept. 2. During the first two weeks of orbit, the spacecraft completed a series of small changes in velocity and also adjusted the angle at which they face the sun, known as “precession.” These were done to optimize the orbit and operation of the spacecraft. On Wednesday, Sept. 5, the Instrument Data Processing Unit (IDPU) for Electric Field and Waves Suite (EFW) was powered up to prepare for the upcoming deployment of EFW’s four booms (per spacecraft), and on Thursday, Sept. 6, the eight Magnetic Electron Ion Spectrometers (MagEIS, another of ECT’s three instruments) were powered up; each spacecraft has four MagEIS instruments that measure widely different energy ranges. The next major instrument activity is the EFW boom deployment, which begins on Sept. 13, when both RBSP spacecraft will be spun up to seven RPM from their normal five RPM. This will prepare them for the change in momentum following the initial deployment of the EFW spin-plane booms. The doors containing the booms will open, and then on Friday, Sept. 14, the first four meters of the booms will be deployed. Over the following days, more of each boom will be deployed every day, until the four booms (each is 50 meters long) are fully out. In roughly the middle of this process, the RBSP MOC team will also send a command to open the door to the aperture on the RBSPICE instrument that will allow it to begin full science operations. The final RBSP instrument to be powered up will be an ECT instrument: the Helium Oxygen Proton Electron (HOPE) instrument, which will be powered up sometime in mid to late October, after the spacecraft have deployed all their booms and completed their commissioning-phase maneuvers.